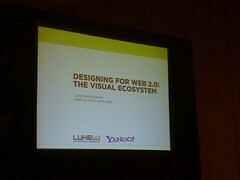 In my Designing for Web 2.0: The Visual Ecosystem talk at Web 2.0 Expo I discussed the changing role of visual design in today’s social, distributed, user-generated, and interaction-rich Web. In the presentation I point out how the ability of visual communication to express core customer and brand messages across multiple forms of media has not changed much. However, shifts from locomotion to services, from pages to rich interactions, from sites to content experiences, and from content creation by webmasters to everyone online have introduced unique opportunities and constraints that the presentation layer of Web applications needs to account for. Check out the slides (PDF) for lots more details.